Press release / Ledia Kostandini has been occupied by a set of postcards for the past seven years. As if sent to her from the past, these seemingly marginal flaps of paper have sent her on countless journeys, seeking traces of a bygone Albania and discovering a new land along the way. Her solo exhibition at Bazament marks the first time that Kostandini presents these personal works to the public. In 2011, Kostandini unearthed a collection of postcards sent to her grandfather, aunts, uncles, and her father, over a period of forty years. The well wishes arrived annually at their home in Pogradec, Albania, always for the new year, from all corners of the country. Sent during Albania’s political isolation between the 1950s and the 1990s, the postcards appear as mere formalisms. But collectively they transform into intimate tidings, with their life stories written on the backside of each card—enumerating essential banalities like profession, status, family life, and personal and professional friends and acquaintances. Like the tension of the postcard’s public intimacy, Kostandini’s work opens up a private world only to remind you that it was always public. Each work in Let Us Meet in Between stages time twice, and space once. In a personal exploration of shifting time, Kostandini has re-photographed, with extreme precision, the exact view of every card. This doubling echoes a lived reality: her grandfather died immediately following a heart attack on the night of 31 December 1982; he was buried the next day. But his remote death did not to stop the cards that had already been postmarked. The installation at Bazament reveals this lived paradox of past, present, and future. The world, and especially the world of Albania, was very different when the postcards were originally received. Years later, Albania appears nearly unrecognizable from its past. As Italo Calvino similarly observed about the “invisible” Maurilia: “just as the old postcards do not depict Maurilia as it was, but a different city which, by chance, was called Maurilia, like this one.” Albania, like Maurilia, becomes a fiction of its own making. The book project “Zing City” was launched on 31st of May in Tirana at DestilHostel. A presentation of the book “Zing City” seen on two perspectives, by its author Ledia Kostandini and the publisher Rita Petro. In this context it will be discussed about the city as a generator of different impressions in terms of aesthetics and feelings. 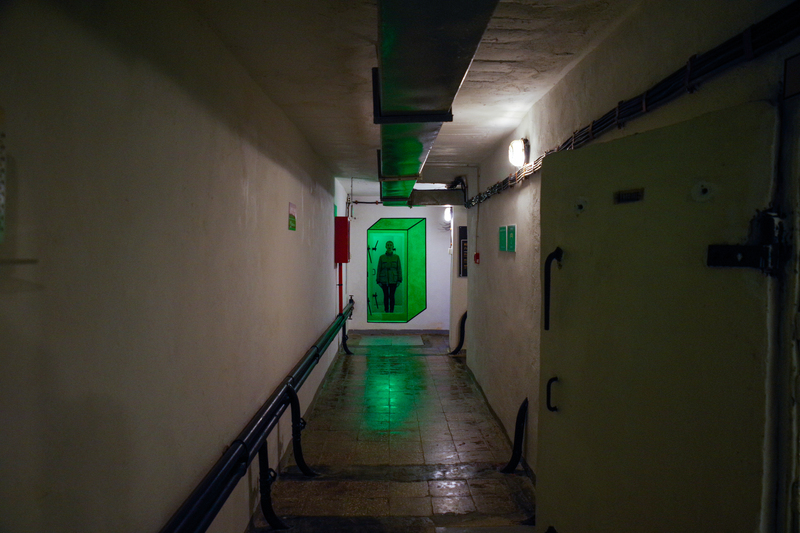 Ledia Kostandini will develop an artist talk about several previous projects which stand on the same conceptual line. This presentation will be in albanian. Një prezantim i librit “Zing City” përmes dy këndvështrimeve; nga autorja e tij Ledia Kostandini dhe botuesja Rita Petro. Në këtë kontekst do të flitet për qytetin si gjenerator i përshtypjeve të ndryshme në aspektin estetik dhe emocional. 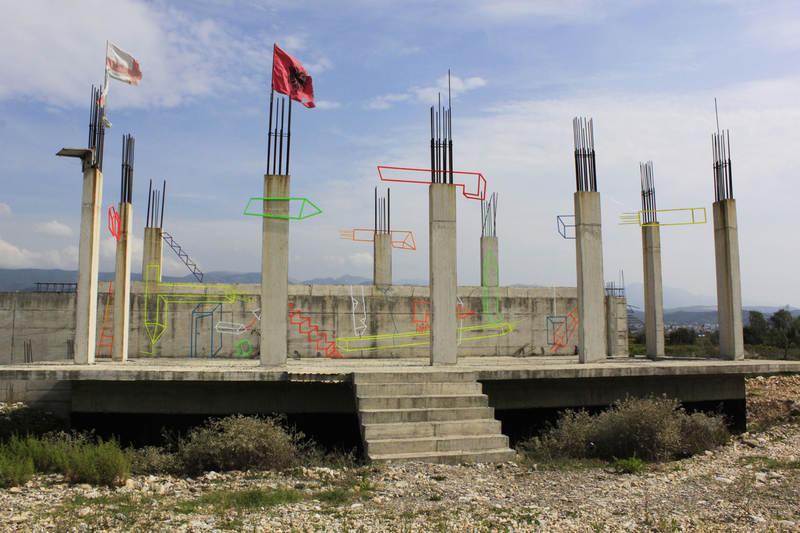 Ledia Kostandini do të zhvillojë një ‘artist talk’ rreth disa projekteve paraprirëse mbi të njëjtën linjë konceptuale. Prezantimi do të jetë në shqip. #ZINGCITY travels to Briey, France. It will be part of the Documentary and Interactive space of the (off-wall) exhibition “Le Corbusier et Léger. #Visionspolychromes“, curated by Elia Biezunski & Anne Horvath, in dialogue with the retrospective “Fernand Léger. Le Beau est partout” in #CentrePompidouMetz. Take the chance to color the book at the Interactive space of the exhibition and visit this impressive place. I am very happy to see my book finalized and ready to make its life into bookstores, homes, offices, bars and wherever it might be given love and attention. I wish it might be a nice experience to each one that will color it and get to know an enthusiastic city, the Zing City. This is a book for grown ups because I believe that coloring is an ageless form of expression and entertainment. It started out of some outdated wallpaper catalogs. The work consists in several individual pieces that fit to one another without any particular order and can be extended infinitely.Window prints, wallpaper textures, paint, cardboard, etc, are used to create some sort of “leaflets”. Interior walls reveal their accurate patterned coziness, while the facade competes using windows as its decorative pattern. It’s a moment of confrontation between two different sides of a single structure. There is a spatial cohabitation with shifting spaces, folded walls and superposed windows. “Paperwalls” at Kalo Gallery untill March 19, 2017. Part of the group expo “Power of grace”. Soon my independent book project “ZING CITY” will be ready to get launched. I am really exited to be able to see this book taking shape after months of work. It is basically a coloring book addressed to grown ups. About 20 illustrations will guide to a crazy city that you will be able to embrace through coloring. “Blockwok” is a project that consists in cutting and transferring parts of the urban architecture into other contexts. Different structures or elements which are usually extracted from informal parts of buildings, turn into construction blocks. I practically paste on wall printed photographic images almost in real dimension. Then it gets developed as a wall painting which may better be called a graphic translation of concrete material. Displacing certain bizarre structures from the urban environment to other context is a way to single them out and look them from a closer distance. “Blockwork” occupies a wall or a space in order to establish a different approach on the urban landscape which is representing the aesthetics of the informal urbanism. 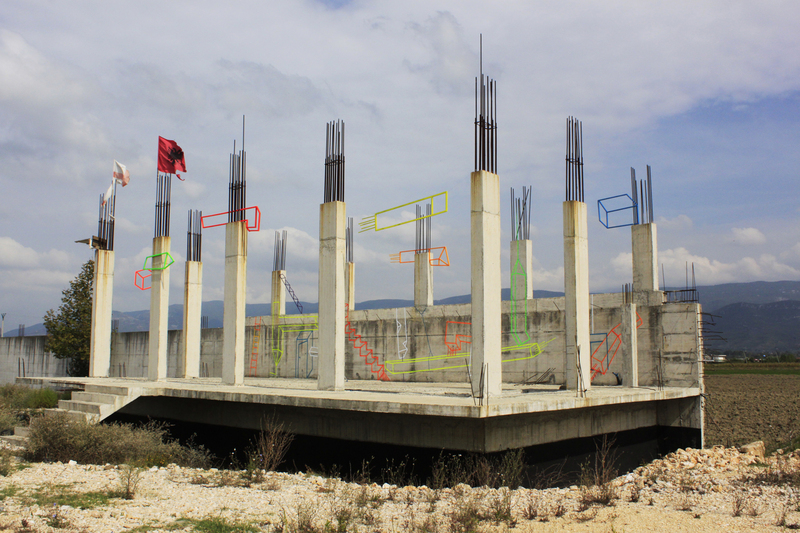 “Blockwork” project was exhibited at “Tulla Culture Center”-Tirana, on May 2016. 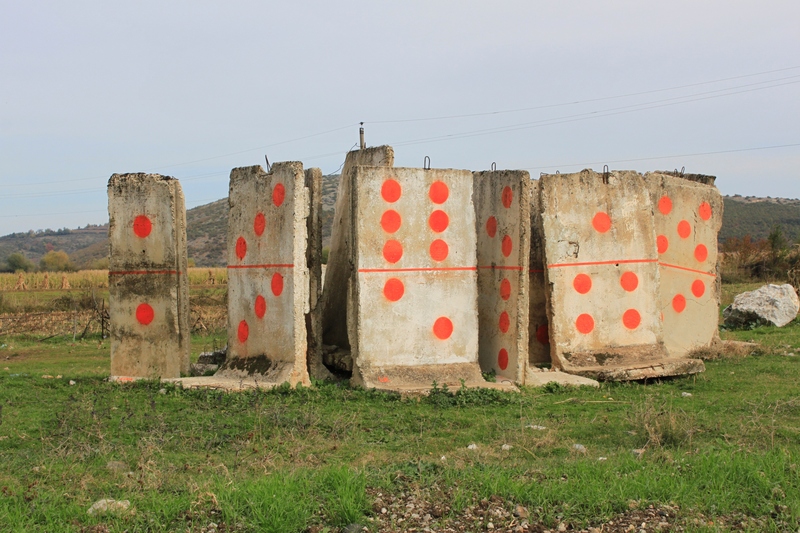 “Falling Blocks” is a site specific intervention installed near Laç. 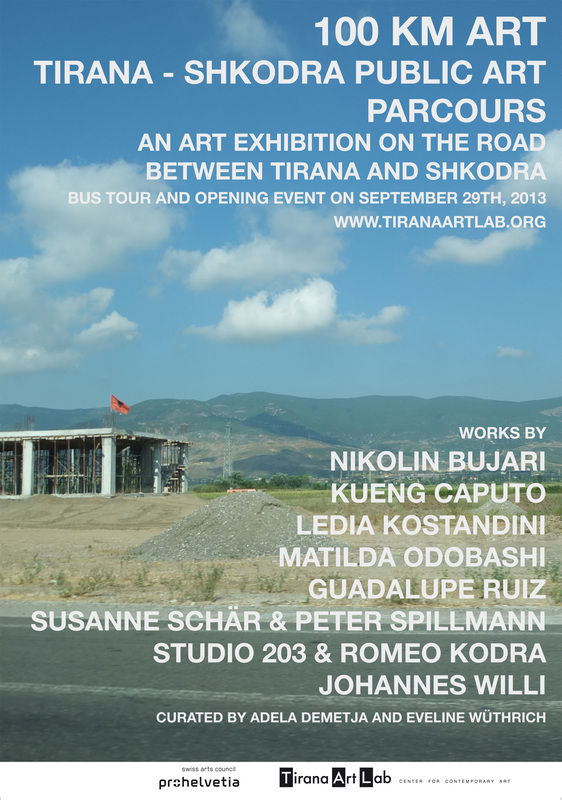 It was presented as a part of Tirana Art Lab’s project “100 km Art”. The artist is symbolically reconstructing an existing never-ending building. She adapts her colourful sketchy-style pieces (columns, stairs, rods) to the bare surface of concrete columns. Click here for more information about “100 KM ART” project. “When I look into the mirror” is an ongoing series of photographs which deals with ambivalence and cohabitation. I place a square mirror in front of different backgrounds, chasing ambiguous situations. The reflected image obviously corresponds to what’s on the backside of the photographer. Still, the mirror view is invited to play the main part in the final composition. Juxtaposing two opposed sides in a single image is a trick I use to visualize the space around me. The photographs have been shown at the Art Market Budapest on October 2015, at ZetaGallery exhibitor.